Prolab Nutrition’s Amino 2000 is an amino acid formula that contains 2000 mg of pure and naturally occurring L-form amino acids in each tablet. 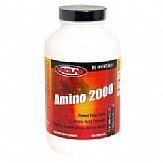 Amino 2000 is scientifically proven and proportioned to meet the individual needs of its consumers. Great for athletes and those who lead a less than sedentary lifestyle. Trainers and athletes require positive nitrogen balance because it is necessary to promote protein accretion and muscle growth. Amino 2000 does just that, as it derives its protein source from the pancreatic digestion of whey. Prolab offers the highest potency, freshness, purity, and maximum nitrogen availability. It is recommended that six tablets be taken three times daily between meals and immediately following intense training and workouts. For best absorption, take tablets with diluted fruit juice or other diluted carbohydrate drink. For the best results, combine Amino 2000 with a complete and well-balanced diet and intense training program. Each serving contains just 50 calories, 0.5 grams of fat, 0.5 grams of carbohydrates, 0.5 grams of sugars, 25 mg of sodium, and 10 grams of protein. 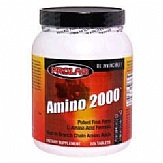 Be invincible and perform at your best with Prolab’s Amino 2000. A superb way to build muscle mass and exceed your nutritional needs and desires.